What does this mean for Aqua Force? The Ripple deck is clearly very hurt by this move. After the widely regarded embarrassment that was the World Championship which you can watch HERE, Bushiroad felt the need to address the deck swiftly. The Ripple deck is infamous for keeping the game at the Grade 2 area, which contradicts the direction Bushiroad is pushing the game, regarding stride. Not only did this deck go against stride oriented decks, it also encouraged this sort of gameplay and vastly restricted the sort of decks that were viable. While intentional gradelock has been a viable strategy since strides were released, Ripple took this to a whole other level, and could very consistently squash any deck that could not play to this level. This turned out to be unhealthy gameplay and needed to go. So where is the clan headed from here? Ripple is still certainly playable, it's just far less consistent. Not only is it a ride chain deck, you also have to draw into one of your two copies of Odysseus to perform the degenerate combos that made this deck strong so early. It's a double whammy, and frankly I wouldn't call it consistent enough to be in the top tiers anymore. Sure you still have chances to see it off Miltiadis, but it overall is not likely and it loses a good chunk of its rush potential. All is not lost for Aqua Force however because there is another powerful alternative for the clan: the Blue Wave sub-clan. Blue Waves received a good chunk of support in the recent Clan Booster but were overshadowed by Ripples. With Ripples out of the picture, Blue Waves now have the spotlight to shine. The Blue Wave early game is nothing to scoff at. While sure nothing really gets to Ripple territory, having access to Blue Wave Marine General, Foivos gives the deck a non-Generation Break version of Magnum Assault. Having this combined with Tidal Assault grants the deck a consistently powerful early game. To capitalize on its strengths and being a deck that actually plays the game with the opponent, the deck makes full use of 2015's Aqua Force power unit, Marine General of Heavenly Silk, Lambros, which still today remains as one of the most powerful strides to have been released. Blue Wave Dragon, Tetra Drive Dragon has a powerful Limit Break skill, which can overpower players who choose to play the Grade 2 game against you (although it is very unwise to use that strategy against an Aqua Force deck to begin with). Lastly, Blue Wave Marshal Dragon, Tetra-boil Dragon joins the pool of powerful re-standing strides, except that it synergizes rather disgustingly well with its break stride, Blue Wave Dragon, Anger-boil Dragon. Re-standing a field, gaining power, and a re-standing G Unit is certainly impressive. Anger-boil at first seems like another copy of Blaster Dark "Diablo"; a vanilla card until reaching GB2 stride. However it works out because Lambros is strong enough to pull the weight of the first stride turn by itself and it synergizes very well with Tetra-boil, while all Diablo does is one measly retire. Regarding its place in the meta, Blue Wave is a strong deck but it is a bit slower than its Ripple counterpart. With Chaos Breaker Dragon close on the horizon, that decrease in speed might be too costly when approaching this new shift in the metagame. All is not lost however, decks can utilize Jockey of the Great Sea, Skyros. It's an interesting unit to say the least, it's GB1 skill gives all of your front row units "resist". While there are ways to play around resist, it can be an annoyance, especially for the dreaded Link Joker match-up which needs Nebula Dragon, Big Crunch Dragon to play around it. Whether or not this card will see play remains to be seen, as it's lack of having Blue Wave in its name may be a hindrance. Generic Aqua Force Thavas builds could make good use of it however. Where to next for Royal Paladin? While Aqua Force looked to have an easy solution, it becomes more complicated with Royal Paladin. The Jewel Knight, Swordmy engine quickly arose to become Royal Paladin's trademark as soon as it was released in G-BT01. The engine defined many Royal Paladin builds such as Altmile-Thing Saver and Sanctuary Guard Dragon, and most players were willing to devote the necessary deck slots to accomodate this card's engine in non Jewel Knight builds. It came to the point where Royal Paladin deck construction started with Jewel Knight, Swordmy and enough Grade 1s, centralizing the clan too much and hurting creativity. This has been the case for a while so eventually it needed something to be done so players do not feel restricted to one engine and can instead choose from several. With the engine suddenly stripped away, what build will Royal Paladin players go to next with all the options available? My insight with Royal Paladin in particular is different than most other players since I tend to think and play outside-the-box, so I will give an outline on where I would personally think the best current option for the clan is vs. what build other players will probably go with. And no I won't be convincing you all to run Altmile, as much as I would love to. 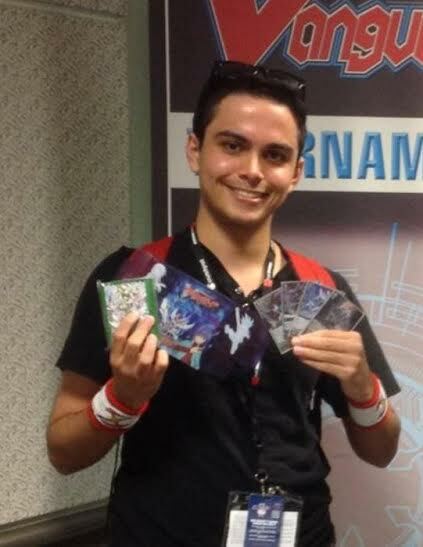 Although feel free to check out my top 4 ARG tournament report from a couple months back with an Altmile deck HERE. Sage of Salvation, Benon was released in November in G Comic Booster 1. Combo'd together with Sword of Hope Richard, you have a counterblast 1 + soulblast 1 for a +2 in card advantage. That's very powerful, almost akin to Oath Liberator, Aglovale + Fast Chase Liberator, Josephus powerful, except you don't have to rely on getting lucky off the top few cards of the deck: it's consistent. Personally I've been using this engine in all my Royal Paladin builds and I found it far stronger than the Jewel Knight, Swordmy engine. Why would I want to +1 and play vanilla Grade 1s when I can instead +2, and have room for stronger Grade 1s? There's also those times in the early game when you do not damage Jewel Knights and have vanilla Swordmies. This engine however did not quite catch on with the playerbase, with most arguing that the 14k column wasn't good. My rebuttal is that Sanctuary Guard builds didn't care, as Benon with three Grade 1s equals a 23k column, which is synonymous with the 25k column Jewel Knight, Swordmy would grant you. As far as numbers go, Swordmy only wins the columns game when there are two Grade 1s present in that deck. Even putting Sanctuary Guard aside, 14k was perfectly fine in the early game against 9k Grade 2s, and the +1 draw helps you draw into additional cards that can either rush, or counter a rush. Why players are selling their Sanctuary Guard decks I do not know. You can very easily switch out your Jewel Knight Swordmies for Benons, have some room for other strong, synonymous Grade 1s like Battlesong Angel, and the deck will be just as good as it was, if not stronger. It should be a very easy fix, as Sanctuary Guard builds already ran Richard in the first place due to Sanctuary Guard Dragon's on-ride skill. In fact, pretty much any Royal Paladin build that does not use Thing Saver Dragon (for soul reasons) or a dedicated Jewel Knight build can easily accommodate the Benon engine. I might turn a few heads here but hear me out: I think Alfred Exiv is one of the strongest builds to take in the G-BT05 metagame. The simple reasoning is this: the Chaos Breaker Dragon matchup and a powerful early game. I'm well aware the power numbers Exiv puts out are not quite as high as Sanctuary Guard or Jewel Knights. However it can put out comparable numbers thanks to Swordsman of Light, Junos and the Royal Paladin stride suite (Squire and Aerial Altmile). In addition, the build is also best suited to take on the wave of Chaos Breaker Dragon builds coming out of the next set having access to Holy Squire Dragon. Sanctuary Guard and Jewel Knights in comparison struggle against this match-up as fast, consistent locking is difficult for them to make plays under. Squire is particularly nice for serving a jack of all trades card in addition for countering lock: it creates specific three stage columns with various cards in the deck and fixes a 14k Benon column on the first stride turn before Aerial Divine Knight, Altmile can be played. The deck's early game is also powerful. Not only does it have the Benon engine, it also has access to Blaster Blade Seeker, which is a good anti rush card going second. Blaster Blade Seeker is also just good in general and its worth shouldn't be understated. Counterblast one retire one is a cost you'd find in Kagero/Narukami decks, but take that and add it to a deck that has a fluid superior call engine as well as power gain. To sum it up, if you want to play a Royal Paladin build that has an excellent match-up in a Chaos Breaker Dragon metagame, Alfred Exiv is the way to go. The numbers are signficantly smaller but it can still put out 3-4 stage column pressure. It has its own unique plays with Blaster Blade Seeker utility and it counters the hyped best deck. If Link Joker is taken out of the equation, sure there are other options that have a bit more punch to them. But taking match-ups into consideration is a huge trait in card games and it should be highly considered when choosing a deck to play. From what I've observed, Royal Paladin players are not just dependent on Jewel Knight, Swordmy, they are somewhat obsessed with it. So much so, even the Benon engine was overlooked because Swordmy was simply convenient. What I expect most Royal Paladin players to do is not let Swordmy leave their decks, but rather leave their decks to play Swordmy. Thanks to Fighter's Collection 2015 Winter, this is certainly a strong route to go with as well. I wanted to originally showcase Climax Jewel Knight Lord, Evangeline in a Fighter's Collection article this week, but I still can do so considering the topic at hand. While Jewel Knights would have originally just been an interesting alternative to Sanctuary Guard, it suddenly becomes more than just that with the new restriction list. The deck is nothing to scoff at however, it fleshes out Jewel Knight, Swordmy to its maximum potential and Evangeline is an excellent card. Evangeline is simple, fast, and very powerful. For each face up Evangeline, every card on your board (assuming your line-up is 100% Jewel Knights) gains +3k power. If you have two, thats +6k and with three, thats +9k. Since you can choose any card to flip over, you can decide to either use all four Evangelines on the second stride turn, or accept a little less power and have an additional turn with her. So with three copies of her face-up, that is +18k power to a column! That's really high, especially considering that an ordinary 16k column suddenly becomes a gargantuan 34k column. Couple that with a Fellowship Jewel Knight, Tracie column and you got 37k right there, which is a six-stage column! Let's also talk about what Jewel Knight, Swordmy can really do. No longer is it just an engine that calls a usually 7k vanilla to form easy 16k columns. No longer do you have to cringe if you don't damage check Jewel Knights. Now the cards that are called can actually do things, and Swordmy has a lot of toolbox options. Cymbeline now becomes a consistent card that can easily pump a Jewel Knight by a staggering 10k power. Christine works as a pseudo-Grade 3 searcher that can easily toolbox Ashlei "R" to your hand. Sabremy can work to turn off Ashlei "R"'s or Salome's Limit Break, allowing them to use their skills quickly when going first. Salome in particular can threaten a crit as early as turn 3 going first! This is also significant because playing the G2 game is ineffectual against this deck due to Limit Break. Jewels have a lot of great things going for them, and Evangeline seems to be the powerhouse that makes it a coherent deck. However, their largest weakness is their requirements of needing three or more other Jewel Knight rears to activate their skills. This makes Jewels more fragile in comparison to other Royal Paladin builds to mass retire and lock. Sanctuary Guard is vulnerable to both, but their plays are not as reliant on having a nearly full board to resolve their skills. Regalie is flexible enough to work with un-optimal boards, which can and do happen. Outside of their Grade 3s and Aerial Altmile, Jewel Knights are limited in their ability to recover from a mass retire if the Swordmies are not appearing in your hand, because the deck needs a nearly full board to resolve most of their skills. Lock is especially painful, even more so if two locks are out, which would mean most Jewel Knights have their skills shut down, due to no longer being able to fulfill the requirement. My synopsis: it's a strong, fast, consistent deck that is very easy to play. It has its flaws and is a bit more fragile than most Royal builds, but I'm sure it will be the go-to build for most Royal Paladin players. Where is the metagame going in general? Right now it is difficult to say because the field is very open and players have grown accustomed to Ripple. Chaos Breaker has been hyped for quite a while, and it was reputed for being the deck that shuts down Ripple. However, it could get outrushed by them if going second and if they open optimally enough. Without Ripple, Chaos Breaker still has a strong niche against many other decks as well as having new support, and Vanguard players like new decks, so I would expect people to flock to it for a while. I still think Royal Paladin and Aqua Force are tier 1 capable when players decide what build to roll with. I definitely expect Revengers to come back with Ripples out of the picture, as they have an interesting match-up against Chaos Breaker that can be determined by player skill. Many of the tier 1.5-2 decks that were pushed away because of Ripple now have the opening they need to re-surface in the meta, provided they are playable against Chaos Breaker. I'd like to know what you guys would think in the comments. As always, Play Hard or Go Home!